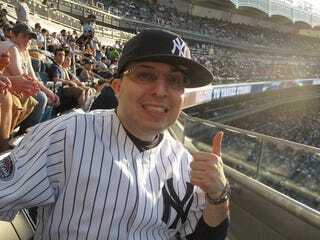 All along, I maintained that Michael was not only the Yankee fan of the month, but of the year, millennium and beyond. In one man, we see the central casting Yankees fan. Chevy and the Yes Network agreed, Michael reported via email with provided link this week. Today, I asked him what it all means. In the words of Kenny Powers, "If they want to see some noise, then I'd give them some noise." I've honestly never thought my video would of gotten this much attention. It's awesome when the regular guy wins or the underdog wins. My two best friends told me if they previewed my yankeesland video that they would of urged me not to upload it. Now, them and other friends that I know keep on asking me when the next video is going to be uploaded. I got plenty of great ideas for next season.